Index of American Indian languages Index of American Indian tribes What's new on our site today! Of all American Indian traditional clothing, the piece we get the most confused email about is the breechcloth. I couldn't find a good website for kids about this topic, so I put this one together, with definitions and links to general sites about American Indian clothing that feature photographs of native men in breechcloths and leggings. Breechcloth and belt A breechcloth is a long rectangular piece of tanned deerskin, cloth, or animal fur. It is worn between the legs and tucked over a belt, so that the flaps fall down in front and behind. Sometimes it is also called a breechclout, loincloth, skin clout, or just a flap. In most Native American tribes, men used to wear some form of breechclout. The style was different from tribe to tribe. In some tribes, the breechcloth loops outside of the belt and then is tucked into the inside, for a more fitted look. Sometimes the breechcloth is much shorter and a decorated apron panel is attached in front and behind. A Native American woman or teenage girl might also wear a fitted breechcloth underneath her skirt, but not as outerwear. 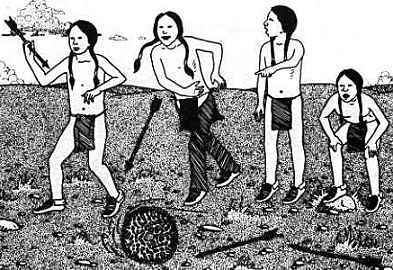 However, in many tribes young girls did wear breechcloths like the boys until they became old enough for skirts and dresses. Leggings sketch Breechcloths leave the legs bare, so Native American men often wore leggings to protect their legs. 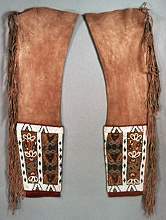 Native American leggings are tube-like footless pant legs, usually made from buckskin or other soft leather. They are not connected to each other--there is one separate legging for each leg. Both leggings are tied onto the same belt that holds the breechcloth with thongs that attach at the hip. Legging styles varied from tribe to tribe. Sometimes they were fringed, like the ones in this picture. Sometimes they were painted with colorful patterns or decorated with beadwork or quillwork designs. Many Indian men tied garters (straps, thongs, or bandana-like cloths) around their leggings at the knee to help keep them in place. Women and girls also wore leggings in many tribes, but female leggings were shorter and were not attached to a belt, simply gartered at the knee. What is an apron panel? A breechcloth apron, breechcloth cover or apron panel refers to a decorated piece of leather or cloth that men wore over their breechclout for special occasions. They were especially used with the short or fitted style of breechcloth. Today a breechcloth apron is often worn with traditional men's outfits that used to include a breechcloth, but no longer do. 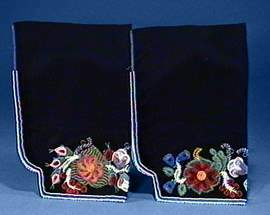 Breechcloth aprons are usually handmade and either painted, embroidered, or decorated with beadwork or quillwork to make them attractive. What did breechcloths and leggings look like when they were worn? Cree boys in loincloths playing a hoop game The four boys in this picture are all wearing breechcloths. The second boy from the left is also wearing leather leggings. You can see how they attach to his belt at the hip. A lot of kids get confused by the way Indian loincloths look when they are being worn. They assume that the breechclout is just a rectangle of cloth hanging from the belt, like a washcloth pinned to a clothesline, and that Native Americans like these boys are naked underneath the cloth. That is false. The cloth winds over the belt, under it, and over it again. If one of the boys lifted his flap, you would see the rest of his breechcloth, which looks a little like underwear. Do Native Americans still wear breechcloths with leggings today? Contemporary regalia Almost never. In everyday life, Native American men usually wear jeans or other modern pants. Some people do wear traditional leggings as part of their regalia (ceremonial clothes used for dances, weddings, or other festivals.) However, very few Native American men wear a breechcloth anymore for any reason other than a historical movie. Some Native American men still wear the fancy apron panels with their regalia, like the straight dancer at the left (the apron is the red cloth panel with floral designs on it, and it would be covering this man's breechclout if he was wearing one.) In reality, though, modern Native American men almost always have shorts underneath instead of a breechclout. Only older people in a few tribes, such as the Mexican Kickapoos, still wear breechcloths. These Eastern Shoshone leggings follow the bowed Plains Indian style, with fringes on the outer seams and beaded designs on the bottom. These are tubular northern style leggings, made of caribou hide and painted with geometric patterns. These are women's leggings, so they only go as far up as the knee. They appear to be made out of blue stroudcloth (a popular legging material in the late 1800's) and have colorful embroidery around the cuffs. 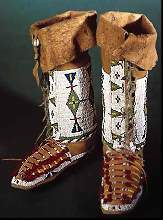 Some Plains Indian women attached their leggings to their moccasins to form a kind of boot, rather than using garters. The legging part of these boots have seam fringes and cuff beading just like the Shoshone leggings. ...And here are a few pictures of breechclouts and leggings in different tribes. This Mohawk man is wearing a tunic shirt over his breechcloth, but you can see the end of his flap protruding in front. Notice the garters at his knees. 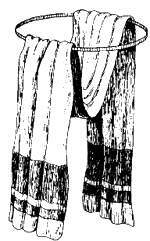 Both he and his wife are wearing characteristic Iroquois leggings with the seam in front, split near the bottom. In this famous photograph of the Apache leader Geronimo, he is wearing a Western-style shirt and jacket but not pants-- instead he wears a Southwest Indian breechcloth made of white cotton. This outfit from the Abenaki Museum includes a leather breechcloth apron with a circle design on it. Here's George Catlin's painting of a Flathead Salish boy wearing the "fitted" kind of loincloth. A good book about native clothing styles and regalia in different Indian tribes, including several pictures of breechcloths. Native American Leather and Clothes: Articles, sketches, and photos of American Indian breechloths and other clothing from different regions.